The Ster-O-Tap water sterilization cartridge consists of a bundle of hydrophillic (water loving) capillary membranes. These membranes are shaped like hollow fibers, closed on the feed side. The water follows a path from the large pores on the outside wall to the small pores on the inside wall. The inside wall of each fiber has very tiny pores - 0.15 microns in diameter (0.00015 mm). These pores are several times smaller than the smallest bacteria, which is about 0.4 microns in diameter. 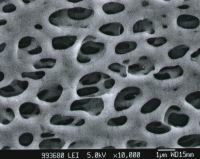 When water flows through these pores, an unparalleled removal of >99.999999% (8 log) of all bacteria is achieved. This prevents harmful bacteria and cysts (like e-coli, crypto and giardia) from reaching your faucet and provides you the protection you need. The patented Ster-O-Tap low pressure membrane technology achieves this remarkable micro filtration with extremely high flow rates at low feed pressure. There is very little pressure drop as with other technologies, such as ceramic. It requires less than 14 psi for a 1 gpm flow. Ster-O-Tap capillary membrane cartridges have been tested and certified by the NSF International against ANSI/NSF Standard 42 for Particle Reduction (Class 1) and ANSI/NSF Standard 53 for Cyst and Turbidity reduction. 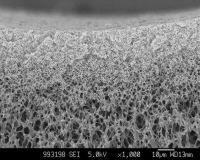 o Permanently hydrophilic with neutral surface charge for low fouling characteristics.